Draft: 2012, Milwaukee Brewers, 31st rd. Is married.....wife's name is Erin....the couple has a son named Liam ... Graduated from Moeller (OH) High School, where he also played basketball ... Graduated from Harvard University with a degree in environmental science and public policy ... His father, Mike, was a safety on Penn State's 1982 national championship team ... His mother, Shirley, was a four-year letter winning swimmer at Penn State ... Is a supporter of the Urban Ecology Center and Eco City Milwaukee ... Enjoys playing the guitar, song writing, dancing, golf, cooking and the environment ... Can often be seen entertaining his teammates with his "raptor" run ... Has a mini golden doodle named Wally.....follow him on Twitter (@bruter24). Went 8-7 with a 4.44 ERA in 20 games (18 starts) with Milwaukee ... Made his first career Opening Day roster ... Was 7-7 with a 4.56 ERA as a starter (94.2ip, 48er) and 1-0 with a 2.70 ERA in relief (6.2ip, 2er) ... The Brewers went 9-9 in his starts ... Produced 2 quality starts ... 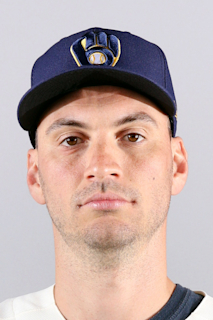 Belted his first Major League homer on 5/8 vs. Cleveland, a solo shot off Corey Kluber.....was the first pitcher ever to hit a home run off Kluber.....was the first left-handed batting pitcher to homer for the Brewers since CC Sabathia on 7/13/08 vs. Cincinnati ... Was on the 10-day disabled list from 7/6-7/13, retroactive to 7/3, with left forearm tightness ... Returned to the disabled list on 7/23 with a UCL tear in the left elbow ... Underwent "Tommy John" surgery on 7/31, performed by Dr. Timothy Kremchek. Spent most of the season at Triple-A Colorado Springs, where he went 6-6 with a 3.50 ERA and 2 saves in 26 games (15 starts).....went 5-6 with a 3.98 ERA as a starter (81.1ip, 36er) and 1-0 with a 2.15 ERA in relief (29.1ip, 7er)...Contract was selected by Milwaukee on 8/19...Went 2-2 with a 3.32 ERA in 14 games (2 starts) with the Brewers ...Took a 7-6 loss in his Major League debut on 8/19 at Seattle (4.1ip, 7h, 4r, 4er, 3bb, 2k, 2hr, 1wp)...In his Major League debut became the first Brewers left-handed pitcher to start a game since Tom Gorzelanny on 8/28/13 at Pittsburgh, a span of 474 games, which was the second-longest streak in Major League history behind only the Dodgers (681g from 9/25/92-7/12/97) ...Made his next 12 appearances for the Brewers in relief and went 2-0 without allowing a run over 12.1 innings (8h, 2bb, 10k)...Earned his first Major League win on 8/23 vs. Colorado...Made his final appearance of the season in a start on 9/30 at Colorado and took a 4-1 defeat (5ip, 10h, 4r, 4er, 0bb, 3k, 1hr). Combined to go 8-4 with a 2.36 ERA in 26 games (17 starts) between Double-A Biloxi and Triple-A Colorado Springs ... Began the year at Double-A Biloxi, where he went 5-3 with a 1.95 ERA in 20 games (11 starts) ... Was promoted to Triple-A Colorado Springs on 8/5 and went 3-1 with a 3.31 ERA in 6 starts ... Pitched for Aragua in the Venezuelan Winter League. Went 10-10 with a 3.96 ERA in 28 games (27 starts) at Double-A Huntsville ... Was a Southern League All-Star ... Tied for fourth in the Southern League in strikeouts (118). Combined to go 7-10 with a 3.43 ERA in 24 games (23 starts) between Class-A Wisconsin and Class-A Brevard County ... Began the year at Class-A Wisconsin, where he went 0-1 with a 1.80 ERA in 3 starts ... Was transferred to Class-A Brevard County on 4/26 and went 7-9with a 3.63 ERA in 21 games (20 starts). In his first professional season combined to go 4-2 with a 3.61 ERA and 2 saves in 14 games (2 starts) between Rookie Helena and Class-A Wisconsin ... Went 4-2 with a 3.92 ERA in 11 games (2 starts) at Rookie Helena before he was promoted on 8/22 to Class-A Wisconsin, where he went 0-0 with a 2.08 ERA and 2 saves in 3 relief appearances. November 1, 2018 Milwaukee Brewers activated LHP Brent Suter from the 60-day disabled list. July 26, 2018 Milwaukee Brewers transferred LHP Brent Suter from the 10-day disabled list to the 60-day disabled list. Torn UCL in left elbow. July 23, 2018 Milwaukee Brewers placed LHP Brent Suter on the 10-day disabled list. Torn UCL in left elbow. July 14, 2018 Milwaukee Brewers activated LHP Brent Suter from the 10-day disabled list. July 6, 2018 Milwaukee Brewers placed LHP Brent Suter on the 10-day disabled list retroactive to July 3, 2018. Left forearm tightness. September 1, 2017 Milwaukee Brewers activated LHP Brent Suter from the 10-day disabled list. August 29, 2017 Milwaukee Brewers sent LHP Brent Suter on a rehab assignment to Wisconsin Timber Rattlers. August 13, 2017 Milwaukee Brewers placed LHP Brent Suter on the 10-day disabled list. Left rotator cuff strain. June 21, 2017 Milwaukee Brewers recalled LHP Brent Suter from Colorado Springs Sky Sox. June 14, 2017 Milwaukee Brewers optioned LHP Brent Suter to Colorado Springs Sky Sox. June 13, 2017 Milwaukee Brewers recalled Brent Suter from Colorado Springs Sky Sox. May 19, 2017 Milwaukee Brewers optioned LHP Brent Suter to Colorado Springs Sky Sox. May 15, 2017 Milwaukee Brewers recalled Brent Suter from Colorado Springs Sky Sox. April 24, 2017 Milwaukee Brewers optioned LHP Brent Suter to Colorado Springs Sky Sox. April 21, 2017 Milwaukee Brewers recalled Brent Suter from Colorado Springs Sky Sox. April 9, 2017 Milwaukee Brewers optioned LHP Brent Suter to Colorado Springs Sky Sox. April 4, 2017 Milwaukee Brewers recalled Brent Suter from Colorado Springs Sky Sox. March 26, 2017 Milwaukee Brewers optioned LHP Brent Suter to Colorado Springs Sky Sox. August 19, 2016 Milwaukee Brewers selected the contract of Brent Suter from Colorado Springs Sky Sox. May 26, 2016 LHP Brent Suter assigned to Colorado Springs Sky Sox from Helena Brewers. May 21, 2016 LHP Brent Suter assigned to Helena Brewers from Colorado Springs Sky Sox. March 4, 2016 LHP Brent Suter assigned to Milwaukee Brewers. September 20, 2015 LHP Brent Suter assigned to Tigres de Aragua. August 5, 2015 LHP Brent Suter assigned to Colorado Springs Sky Sox from Biloxi Shuckers. April 2, 2014 Brent Suter assigned to Huntsville Stars from AZL Brewers. August 31, 2013 LHP Brent Suter assigned to AZL Brewers from Brevard County Manatees. April 26, 2013 Brent Suter assigned to Brevard County Manatees from Wisconsin Timber Rattlers. August 22, 2012 Brent Suter assigned to Wisconsin Timber Rattlers from Helena Brewers. June 18, 2012 Brent Suter assigned to Helena Brewers from AZL Brewers. June 16, 2012 Brent Suter assigned to AZL Brewers from Milwaukee Brewers. June 15, 2012 Milwaukee Brewers signed LHP Brent Suter.